How the Video Brochures work when we open the card? Video Brochures works with a magnetic sensor. This sensor triggers the video to play when anyone open the card. How much time is needed to charge the Video Brochure? Usually each card will take 2-3 hours for a full battery, depending on the battery size. I do not want auto start button in my Video Brochure. Is it possible? Yes, this is feasible to initiate the video when to press the play button. For this a simple button works as an on/off button will be added. How many screen sizes are available in Video Brochures? Our Video Brochures come in a variety of screen sizes respectively 2.4 inches, 2.8 inches, 3.5, 4.3, 5, 7 and 10 inch. Screen size will affect the overall size of the Video Brochure. What sizes are available in Video Brochures? We have A5, A4, 5 X7 and even Business Card size in Video Brochures. Can I load the videos to the Video Brochures? Yes, you can yourself load the videos to the Video Brochure. We are there to help you how that can be done. How do the Video brochures charge? The brochures can be charged by Micro and Mini USB cables. It depends on the type of card as to the kind of USB cable. Can I have the full color print for the complete Video Brochure? Yes, we can provide you with the templates of your choice and requirement. What if I need to have last minute change in the video? We had had customers who required the changes when the project was delivered to them. Our team can manage to upload a new video without hassle. But charges may apply for last minute changes. How many shapes are available in Video Brochure? We are offering our Video Brochures in many shapes. What type of print is used in Video Brochures? Our Video Brochures are offset litho printed. As well as we also offer matt gloss and other print finishes. What if I need custom inserts and designs in Video Brochure? For this, we can make your Video Brochure in a variety of different ways. 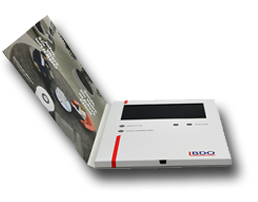 Like Video Brochure in a presentation box, for leaflets, custom stands for point of sale, etc. Can you have different buttons on the Video Brochures for play, pause, etc.? Yes. Our Video Brochures have support for various buttons and layout of buttons. Because of the custom nature of the brochures, we can design them as per your need. Can I add more than one video on a Video Brochure? Yes, you can add multiple videos. We can even arrange function buttons to display specific videos at your request. Video Brochures contains only video content? 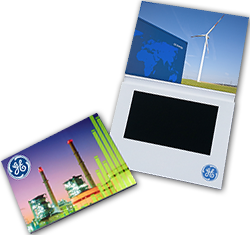 Our Video Brochures works like memory products. In this case, if you have PDFs or other files these can be accessible through plugging the Video Brochure into a laptop or desktop via USB.